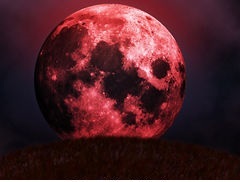 The blood moons are part of a tetrad, a set of complete and consecutive lunar eclipses that will begin on April 15 and continue at roughly six-month intervals until October 2015. According to NASA, seeing four complete lunar eclipses in a row is very rare. The skies were tetrad-free from 1600 to 1900. But in the 21st century, there will be many. However, total lunar eclipse tetrads occurred on Passover and Tabernacle festival dates in AD 162–63, 795–96, 841–43, and 860–61, during which no outstanding events in Jewish history happened. Please consider that while total lunar eclipse tetrads are rare, lunar eclipses are common. According to astronomers two to five lunar eclipses, including partial eclipses, occur every year. The number of total lunar eclipses ranges from zero to three per year. This brings up the question “Why four blood moons”? The Bible doesn’t mention a number of lunar eclipses. It appears that varying the number in a sequence raises the probability of finding a match with significant historical events dramatically. Yes – the world is a mess! Well, the world certainly is in turmoil. It doesn’t take a prophet (or a Bible scholar) to see that there is a good chance that “something big” might take place in the near future. From the tumultuous middle east to the upheaval in the Ukraine the world seems to be in a constant state of agitation. It’s more likely that something significant will happen in the next year or two than not. The point is, if something “big” does take place, will it have anything to do with Bible prophecy-related to “blood moons”? Clearly the answer is no. The Bible passages that proponents of the “blood moon” prophecies quote have nothing to do with events occurring in our world today. But don’t take my word for it – let’s go to the scriptures that speak of “blood moons”. So how do we know that these predictions are not based on prophecies from the Bible? Well, it’s easy if you look at the context. The foundational passages that “blood moon” proponents cite is from Acts 2:19-20 and Joel 2:30-3, according to sources such as the Washington Post and the New York Daily News. In this passage in the second chapter of Acts, we have Peter quoting from the Old Testament book of Joel (Joel 2:28-31). Peter is telling the assembled Jewish crowd that what they are witnessing is the fulfillment of an Old Testament prophecy. God is pouring out His Spirit on all flesh just like He promised to do. Peter quotes the prophet Joel including his use of celestial body symbolism. Joel’s “blood moon” prophecy was being fulfilled right before their eyes. But did these first century Jews actually see the moon turn to blood? No! What did they witness then? They were eye witnesses to a dramatic, earth and heavens shaking event of the long promised outpouring of the Holy Ghost. What is very clear in this passage is that the “darkened sun”, the “blood moon” and the “day of the Lord” that Joel spoke of happened in the 1st century A.D. Peter was not quoting from the book of Joel and pointing to a future time in which this prophecy would be fulfilled. Their entire world was being shaken. The Old Covenant sacrificial system was coming to an end. This outpouring of God’s Spirit would set in motion other heaven and earth-shaking events including the destruction of the old covenant temple and the entire city of Jerusalem in 70 A.D.
Peter was not speaking of a time thousands of years in the future. He was speaking directly to his audience in the first century. When Peter told them “this is that” he is pointing out to them that what they witnessed is what was predicted by the prophet Joel. What Peter is not saying is “Don’t worry, what you see really is not important, this won’t happen for another two thousand years”. Also notice that Peter says that this outpouring of the Holy Ghost will occur in the “last days“. Which “last days” is Peter referring to? Well to Peter the “last days” would be when Joel’s prophecy regarding the outpouring of the God’s Spirit would occur. He was NOT referring to a time two thousand years into the future or the “end of the world”. And as far as we’re concerned this initial outpouring of the Holy Ghost on the Day of Pentecost first occurred nearly two thousand years ago. Peter is declaring to his first century audience that Joel’s prophecy is now being fulfilled. Joel used the apocalyptic language of a darkened sun and a blood moon to describe this major prophetic event. However, it has nothing to do with us in the year 2015. You can’t separate the outpouring of the Holy Ghost from Joel’s use of the poetic language of the darkened sun and blood red moon. The manner in which Peter interpreted the prophet Joel makes the interpretation of the “blood moon” proponents impossible. There may be significant world-shaking events in the near future, some of which may involve Israel. But they will have nothing to do with the fulfillment of Acts chapter 2. Books on the “blood moons” are being written by well-known Christian authors. I’m sure they are just flying off the shelves and making the authors a ton of money. My suggestion to you is to keep your money. Study your Bible and rightly divide the word of truth for yourself. Remember that the prophets and apostles often referred to celestial bodies to bring to light “earth-shaking” events – such as the first outpouring of the God’s Spirit on the Day of Pentecost!